Under the Lands for Settlement Act 1892, the government bought up estates and then offered smallholdings for lease by ballot. 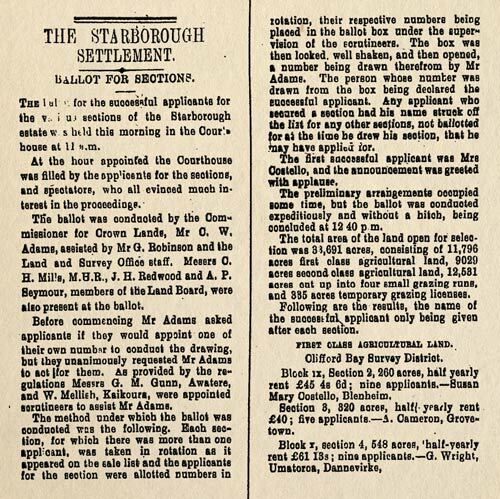 The Starborough settlement ballot was held on 16 March 1899. The press report shown here records that the successful applicant (out of nine) for one 2,260-acre (914-hectare) holding was Susan Costello of Blenheim. She may have applied on behalf of a husband or a son, but could have done so on her own account. A 363-acre (147-hectare) section ‘accounted the best in the estate’ attracted 45 applicants, and was secured by J. McConway of Spring Creek. Most of the successful applicants whose place of residence was recorded were from Marlborough.